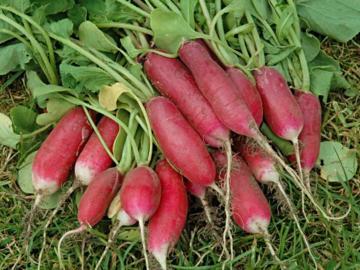 Popular vegetable producing fleshy elongated, red and white roots of excellent delicate flavour. Moist, fertile, light soil in sun. Dislike very heavy or acid soils but will grow in part shade. Very easy and fast growing. The roots are harvested while still young and before flowering. From seed, sown in succession every 2 or 3 weeks from spring until September. Usually produces a crop in 4 weeks. Culinary salad vegetable mainly grown for the crisp, sharply flavoured roots. The leaves and seed pods are also edible. Has medicinal uses, being particularly beneficial for the digestion. Contains raphanin, which is antibacterial and antifungal. This variety has been in cultivation for at least 100 years.